The NDA seems bent on subverting the RTI Act. Is the slow dismembering of the CIC part of the plan? Overall 37,788 cases currently pending before the CIC. Will take an estimated 24 months to be disposed at the current rate. February still had a day left when in a curt reply, the Union ministry of home affairs declined to furnish any information on how recipients of the Padma awards were chosen. “The process is not yet complete,” said the Central Public Information Office (CPIO) a month after the awards were announced on the eve of Republic Day. The req­u­ired information was released in earlier years and even put up on the MHA website. A week later, the CPIO turned down ano­t­her RTI application for the correspondence between then PM A.B. Vajpayee and then Gujarat CM Narendra Modi, during and after the post-Godhra riots. The information, said the MHA, involved “third parties” and could not be divulged. The appeal against the denials are unlikely to be heard anytime soon, since the office of the Chief Information Commissioner, the only competent authority to hear the appeals, remains vacant. North Block appears to have finally found a way of stonewalling RTI activist Subhash Chandra Agarwal, whose app­li­cations elicited a steady stream of embarrassing information when the UPA was in power. It was after all an RTI application by him which revealed a finance ministry note that named P. Chidambaram for not insisting on the auction of 2G spectrum. “The government might as well repeal the Act,” says Agarwal in apparent disgust. The BJP’s U-turn has been remarkable. In 2011, when then PM Manmohan Singh called for a review of the act and its effect on governance, Rajiv Pratap Rudy, now a Union minister, had asserted self-righteously, “We never expected the PM would tell the country that money is was­ted on RTI and the time of officials is being wasted.” But while the BJP, in opposition, was vociferous in opposing any attempt to dilute the Right to Information Act, in power, it seems to have lost its voice on the subject. Indeed, the ruling party and the Congress have made common cause in defying the CIC’s ruling that since the six national parties received significant funding from the government in terms of land, bungalows etc, they are covered by the RTI Act and must be deemed public authorities. In a reply in the Rajya Sabha, the Centre asserted that “declaring a political party a public authority under the RTI Act would ham­per its working and the information could be misused by rivals”. On October 12, 2015, the path-breaking act will become 10 years old. But while the 4.5 million applications that pou­red in last year (compared to 3.5 million applications under the transparency laws in the US) makes India a front-ranking country in upholding transparency, an insidious attempt seems to be under way to stifle and kill it. Both the UPA and the NDA are guilty of giving in to bureaucrats on the implementation of the RTI Act. Not content with packing the information commissions with retired bureaucrats, neither government took penal provisions seriously. Few bureaucrats have been punished for delays in filing replies or for admitting mistakes in the delivery of public services. Both parties have been guilty of evading responsibility in paying compensation to citizens also. A far more sinister plot, however, is now unravelling. Through a March 11, 2015 letter, the PMO has for the first time seized control over the administration of the Central Information Commission (CIC)—delivering a decisive, fatal blow to the RTI Act. The damning letter sent by the department of personnel and training (DoPT)—which works directly under Prime Minister Narendra Modi—to the CIC, in three short paragraphs, delegates the financial powers of the commission, so far vested in its chief, to a government-app­ointed secretary of the CIC, a bureaucrat on a leash. With the CIC being headless for seven months, for the first time in a decade, the delegation of the chief’s financial powers to the secretary is being read as a ploy to indefinitely defer the appointment. “This move will ensure that the commission will not have to approach the DoPT for all administrative matters in the chief’s absence is the reason given by the government. However, it also reveals the unwillingness of the government to appoint a new chief information commissioner,” says a former CIC chief on condition of anonymity. On December 31, 2014, the PM approved the formation of a ‘search committee’ for recommending a panel to the selection committee, that comprises the PM, Arun Jaitley and the Congress’ LS leader Mallikarjun Kharge, for the appointment a new chief. This search committee met for the first time nearly two months ago on January 16, in the cabinet secretariat at the Rashtrapati Bhawan. Thereafter, it met again, within a 20-day period, on the afternoon of February 6 at the same venue. In a shocking response to an RTI application probing the outcome of these meetings, the DoPT admitted in a written reply that it had not maintained minutes of the meetings and hence was in no position to confirm who attended them. It is worth recalling that the Supreme Court had come down heavily on the coal ministry for not maintaining minutes of meetings held by committees which allocated coal blocks. But while the BJP was the beneficiary of the damaging disclosures then, it does not appear to have learnt any lesson. Those in power have always been averse to the RTI. Former PM Manmohan Singh had on more than one occasion voiced his uneasiness on the impact made by the disclosures. The Act, he felt, could discourage honest, well-meaning public servants from giving full expression to their views, even averse to putting down their opinion on files. Aruna Roy, one of the architects of the act, had been quite acerbic in her reaction to this. “This business of not noting is exposing the fact that officers are inefficient. They get paid to write notes; if they are not writing notes, they are not doing their basic job,” Roy had quipped. By keeping the post of CIC vacant, the PMO benefits in more ways than one. Only the CIC is authorised under the Act to hear appeals against the PMO, CVC, CAG, SC and 34 other ministries and departments. With the post vacant, 40,000 appeals remain pending (24,000 in October) and the PMO and these ministries have got away by not furnishing information under the RTI. Curiously, these ministries have not yet been allotted to the remaining seven information commissioners either. “The last appointment to the Commission was made towards the end of 2013, when five ICs were inducted. Three of them, including chief Rajiv Mathur, have retired since then. Yet, no fresh appointments have been made. This is a conscious step to strangle the body,” says a former chief (a full body comprises of 10 ICs plus the CIC). “For nearly 10 years now, the position of the chief had never been left vacant even for a day. In fact, we would get a notice about the next chief a week before the retirement of the incumbent,” he added. The existing ICs have also delivered poorly, even as the Centre continues to appoint them arbitrarily. As recently as March 16, the information commissioners threw up their hands claiming ‘helplessness’ in ensuring compliance of their order by political parties. “It is shameful that the commission claims to be helpless in enforcing its own decisions. It surely has the power to take recourse to other organs of the government in order to ensure compliance,” says Wajahat Habibullah. Some former information commissioners point out that nothing prevents the bench of commissioners from resigning. The seven existing ICs have together disposed of just 16,000 cases in 2014. This is a relatively poor record, compared to the 22,000 cases disposed of in 2011, by only six ICs. Even the RTI norms stipulate that each commissioner should dispose at least 3,200 cases annually. But “no one is holding the existing commissioners accountable for their gross inefficiency”, says Shailesh Gandhi. The situation in the state information commissions across the country is even worse, with huge levels of pendency, ran­ging up to an estimated 60-year period in Madhya Pradesh (see graphic). “Information commissions in Gujarat, Rajasthan, MP, Manipur and Assam among several others have been dysfunctional for long periods,” says Anjali Bha­r­adwaj, an RTI activist and member of the National Com­mission for People’s Right to Information. ICs across the country have not imposed penalties in over 96 per cent of cases where it should have lawfully been imposed to ensure compliance, thereby leaving the act completely toothless. In stark contrast to popular perception, the nature of information sought through the RTI Act is largely innocuous. A majority of the questions pertain to individual rights and grievances. A study conducted by the RTI Assessment and Advocacy Group (RaaG) and the Centre for Equity Studies (CES) reveals that a majority of those using the Act are the poor and marginalised, trying to access information about schemes and benefits which should have been provided to them as a matter of routine by the concerned departments, under Section 4(1)(b) of the RTI Act. The purpose of suo motu disclosures is to make the functioning of public authorities transparent and also to reduce the need for filing individual RTI applications. The law man­­dates that these disclosures need to be made for any information pertaining to procurements made, public services proposed to be provided through public private partnerships, transfer of employees in public authorities, citizens charter, CAG/PAC paras, RTI applications, discretionary and non-discretionary grants and foreign tours of the PM and ministers. More than 67 per cent of the information being sought falls within the purview of information that ought to have been proactively published, according to the study. Pension stopped ‘by mistake’: Till three years ago, Sumitra Devi (80) lived in a jhuggi, paying a monthly rent out of the Rs 1,500 she received as widow pension. In April 2012, she abruptly stopped receiving it without being given any reason. This was her only source of income since she stopped working as a domestic help at 70. “My landlord asked me to get out because I couldn’t pay the rent,” she says. She now survives on the food her neighbours can spare her. In June 2013, she filed an RTI application seeking reasons for the stoppage of her pension. Receiving no information after her first appeal, she filed a second one. In the hearing, the CIC ordered the Women and Child Development department to pay her Rs 43,500 as the amount of pension due to her for 29 months and a compensation of Rs 5,000 a month for stopping her pension without notice. But till March, the department had not complied with the order. “I went to every office they asked me to. 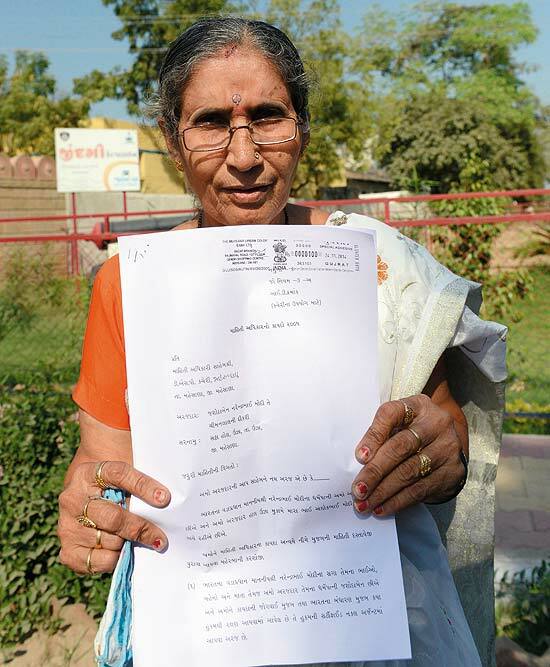 They finally said I’d get all the money at once, but I haven’t got a rupee.” Another hearing on non-compliance of the order is scheduled for March 25, nearly three years after she was rendered homeless and left to fend for herself. Welfare schemes go abegging: A technician servicing ACs, Ramesh Chand lives in a slum resettlement colony in Delhi. He had applied for grants under the Ladli Yojna Scheme of the Delhi government that seeks to encourage education of the girl child in BPL families through monetary help after the birth of a daughter in 2008. Receiving no response, he filed an RTI application and received a reply stating that his application to the scheme was incomplete. After his first appeal to this went unheard, the case came up before the CIC on a second appeal. The women and child welfare department said as he had not submitted proof of residence, his application was rejected. It failed to produce the receipt of the posted letter. Censuring the department for having taken six years to respond, the CIC on August 5, 2014, asked Ramesh to file a detailed application seeking compensation. While that was filed within a week, he is yet to hear about his compensation from the commission. Wrong data entry stops ration: Rukam Pal (63) and his wife were Antyodaya ration card-holders. The scheme is meant for the poorest. Both iron clothes for a living and make less than Rs 150 a day. “We have five grandchildren to feed; one day our ration card was declared invalid,” rues Pal. An RTI application filed on his behalf in March 2012 elicited no response while a second appeal came up before the CIC a year later in February 2013. The commission ord­e­red Rs 18,000 as compensation for Pal for the 12 months they did not receive the ration. The department of civil supplies first filed a writ petition seeking the quashing of the CIC order. When it came up for hearing in the Delhi High Court in September 2014, the department asked to be let off on the ground that it would have to pay similar comp­ensation to others, adding up to a very high amount. While the HC dismissed this plea, the couple hasn’t rece­ived anything. The CIC website shows their case as ‘disposed’.